The common hepatic duct is the part of the biliary tract formed by the convergence of the right hepatic duct (which drains bile from the right functional lobe of the liver) and the left hepatic duct (which drains bile from the left functional lobe of the liver). The common hepatic duct then joins the cystic duct coming from the gallbladder to form the common bile duct. The duct is usually 6–8 cm length. The hepatic duct is part of the biliary tract that transports secretions from the liver into the intestines. It carries more volume in people who have had their gallbladder removed. It is an important anatomic landmark during surgeries such as gall bladder removal. It forms one edge of Calot's triangle, along with the cystic duct and the cystic artery. All constituents of this triangle must be identified to avoid cutting or clipping the wrong structure. There is some normal anatomic variation of the diameter. 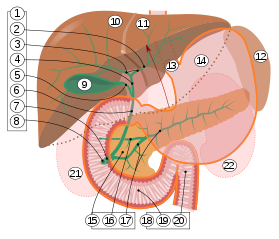 The common hepatic duct is about 6mm in diameter in adults, with some variation. A diameter of more than 8 mm is regarded as abnormal dilatation, and is a sign of cholestasis. ^ Hoeffel, Christine; Azizi, Louisa; Lewin, Maité; Laurent, Valérie; Aubé, Christophe; Arrivé, Lionel; Tubiana, Jean-Michel (2006). "Normal and Pathologic Features of the Postoperative Biliary Tract at 3D MR Cholangiopancreatography and MR Imaging". RadioGraphics. 26 (6): 1603–1620. doi:10.1148/rg.266055730. ISSN 0271-5333. Anatomy photo:38:03-0302 at the SUNY Downstate Medical Center - "Stomach, Spleen and Liver: Contents of the Hepatoduodenal Ligament"